You know how it goes: you're not going to start the drama, but then Twitter friends start mentioning how enjoyable it is, and you can't help but take a peek, and then you find you're watching the drama. Initially even my love for Lee Hong Ki wasn't enough to start watching, but of course he's a reason I'm staying too. So far the drama is by no means drama crack, but it moves along at a decent pace with no completely egregious film work making it hard to watch. It's no masterpiece, but it has an interesting main plot with some rather run-of-the-mill side-plots like birth secrets, doppelgängers, chaebols, family curses, cold and emotionally injured male leads, resident idols, poor girl, kind second male lead. I feel like I'm going through a checklist here. Sung Hyuk is lovely as our resident second male lead, Jang Yi Hyun, and he's handsome and charming, and totally going to get his heart broken. He reminds me an awful lot of Kim Hyun Joong's Ji Hoo character in Boys Over Flowers actually. I'm not really sure how his half-sibling-ness is going to play into all of this. I can't quite make out if his dad was the married before and then married into the rich construction company with a second marriage, or whether his dad had an affair. Judging by the way Ma Jae Ran (Shin Eun Jung) reacts to him, it seems like she's not the one who is his blood parent and he has the same last name as Jang Yi Kyung, so I'm guessing his blood parent is his father in the construction company. Ji Hyun and Doo Rim also have some great chemistry, and it's interesting to watch how comfortable they are with each other. That little neck-tie tying scene was a cute scene. He does seem to know an awful lot about his sister though for a platonic sibling relationship, but then again he could have been asked to do the research to train Na Doo Rim. It's really interesting watching Lee Hong Ki be the cold and stiff Choi Kang Joo towards most of the people around him. He was perfectly charming at that little swoonworthy concert kiss though ^^, but man is he uptight most of the rest of the time! The whole kidnapping backstory is really interesting as well and perhaps explains why that's so. We also know that he struggles to believe that the woman set to marry him actually wants to marry him and not the title, which is completely understandable. I also thought that the scene where she comes back to the mansion (after the ghost messes with the sign-posts) and she makes him help her make dinner should be a sign to him that perhaps she doesn't just want the the fancy name and title. If he thinks about it, then her asking him to peel onions and wash dishes could very well mean she's treating him as a person and not the Taeyang CEO. I'm sure he'll figure things out eventually. I do love how hypnotized he seems to be by who he thinks is Yi Kyung. He's just so curious about her that he can't stay away, and apparently he doesn't mind kissing her (which I don't mind at all either). Na Doo Rim is an interesting character in that she hasn't really had too much trouble playing the role. Sure we've had some flubs, but I'm having a bit of a hard time accepting that everyone except the somewhat senile grandmother seems to know she's not Yi Kyung. Even her best friends don't seem to have noticed, but yet Doo Rim's bestie did. How convenient. So far Yang Jin Sung is doing a believable job playing two very different characters and I don't mind suspending my disbelief. I really loved her interaction with the grandmother who peed on her. Doo Rim is definitely a very lovable character and I can see why everyone around her sees her as a "warm spring breeze". Of course this is going to be rather problematic for the future when the time comes for her to die (which I am pretty sure won't happen). The little alkkagi game she plays with her future father-in-law was also delightful. It was just so cute how happy he seemed as well. Why do Jang Yi Kyung and Na Doo Rim look so alike? Are they blood-related? Why is there a family curse in the first place? If we know why, then maybe it can be solved and done away with. Does the future father-in-law know about the curse? Or does he sort of know about it, doesn't believe in it (that whole accident conversation post nightmare about his first bride) and is in denial? It's confusing me a little because he does seem to like Doo Rim (as Yi Kyung) quite a bit and it would then seem weird if he was okay with sacrificing her. Apparently the mothers don't have such a problem. 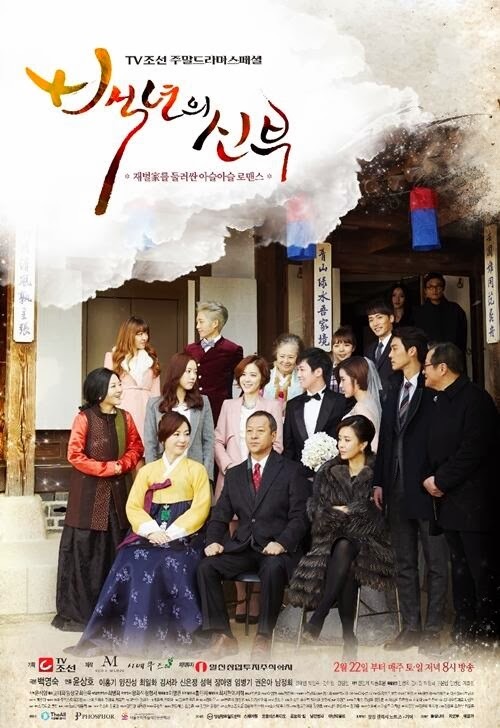 How much about the curse does the second wife (Kang Joo's mother) know about? And does she want Kang Joo to marry Lee Roo Mi? So yup. That's about it for now. I'm not going to do any screencapping intensive posts or anything about the drama, but I might do something like this again at the half-way point. Maybe. What are your thoughts about the drama so far? Squeeworthy moments? Favourite characters? Best scenes? Thoughts and predictions?